With the UE55HU8500 Samsung has established its credentials as a leading light among makers of 4K/UHD screens. The curve won't be for everyone but it makes this a unique proposition in the 55-inch 4K market. You could be forgiven for thinking that AV manufacturers actually like making it hard for us to choose a new TV. As if it wasn't tricky enough thinking about factors such as screen size and resolution, ease of use, smartness, design, and performance we now have to decide whether we want our screens flat or otherwise. This curveball should probably be the UE55HU8500 biggest talking point, but we need to clear up another point first, concerning 4K/UHD. If you bought a 4K TV last year it would not work with any future 4K broadcasts or downloads. It probably wouldn't have had the correct version of HDMI sockets required to receive 4K pictures. Even if it did, chances are it wouldn't have had a HEVC decoder, which is also required to show broadcast 4K. This year, aside from the odd exception (Bang and Olufsen, I'm looking at you), you're on safer ground as far as HEVC decoders go and nobody is stupid enough to make models without HDMI 2.0. But just when you think everything is hunky dory in 4K land, someone like Panasonic drops a bombshell, revealing that its flagship AX802 can't show 4K Netflix. Panasonic argues that in the grand scheme of things this is no big deal as Netflix's 4K output is minuscule. But it's the televisual equivalent of buying a car such as a Bentley or Jaguar and finding out you can't use third gear because it needs a special type of fuel or some special processor (with no modifications available). Happily, the UE55HU8500 is armed with an HEVC decoder and all geared up to show 4K content from Netflix. Here's a quick aside, concerning the use of the terms UHD and 4K. Strictly speaking 4K refers to the 4096 x 2160 pixels resolution used by Hollywood cameras and found only in the cinema and on domestic 4K projectors. TV screens have a slightly reduced horizontal resolution and scrub up to 3840 x 2160 pixels, so calling Ultra HD screens 4K is incorrect but don't expect a miss-selling scandal along similar lines as PPI. For all intents and purposes it's a semantic issue which will remain unresolved whilst some brands use 4K (Sony) and others, such as Samsung, Toshiba and Philips, use UHD or Ultra HD. LG and Panasonic unequivocally say Ultra HD 4K or 4K Ultra HD to cover all the bases. Whichever term you hear it simply means a screen with a resolution which is four times as many pixels as you get on a full HD 1920 x 1080 screen. 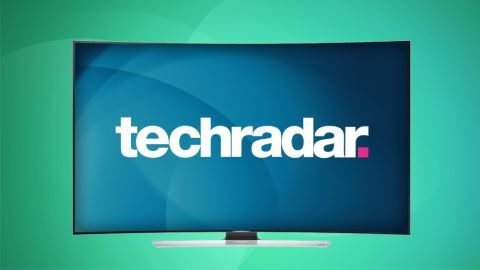 With its 55-inch screen, the UE55HU8500 is the smallest model in Samsung's flagship TV range for 2014, following closely on the coattails of the UE65HU8500, which has already scored itself a five-star TechRadar review. The UE55HU8500 costs £2,700, and the extra 10 diagonal inches of screen acreage on the 65-inch model will set you back an additional £1,300. Rivals to the UE55HU8500 on the 4K stage include the Sony KD-55X9005B, Panasonic TX-58AX802 and LG 55UB950V, although all of these are flat as Samsung is still the only member of the curve club when it comes to UHD. Pending the release of proprietary 4K movie servers from Samsung and Sony, Netflix remains the sole source of broadcast 4Kness. The UE55HU8500 has all the right 4K/UHD credentials to show House of Cards Season 2 (Breaking Bad is next in line) including the aforementioned HEVC decoder, HDMI 2.0 (which enables lip sync correction) and HDCP 2.2, a vital copy protection measure required by Hollywood. The other main attraction is the TV's curved shape. Samsung has shown all kinds of scientific research that proves a curved screen delivers a more immersive picture, but it does create something of a sweet spot, such that you need to be sitting at an optimal distance (no more than 2.5m away), and more or less opposite the screen. Regardless of whether you think the screen has curve appeal you can't argue with the slickness of the overall design, which is both slender and elegant. Like the 65-inch model though, it looks a bit odd if mounted on a wall, as if its edges have curled up like one of those fortune fishes you get in Xmas crackers. There's plenty of state-of-the-art picture processing onboard including PurColor, which analyses 192 points compared with 27 points last year. There's also UHD dimming, which calculates and optimises blocks of light (not just along the edge), separating the foreground from the background. Critically for upscaling non-4K sources, a process called automatic resolution recovery is featured. This enables the screen to detect a source's original resolution (eg standard def footage that's been upscaled by a broadcaster), implement noise reduction and enhance detail, before finally upscaling to 4K. The UE55HU8500 uses a separate connections box, tethered to the TV by a single cable, which provides a degree of future-proofing and makes accessing all of the sockets much easier. The only issue I have with it is its excessive fan noise, which is enough to prove distracting during periods of quietness, such as the moments before a serve at Wimbledon. It being a major sporting year (when isn't? ), Samsung is keen to emphasise the UE55HU8500's so-called football mode, which cranks up the picture and sound settings to recreate the visual and aural experience of being pitch-side in the Maracana stadium. The provision of twin tuners means that, for example, someone can watch the footy on the TV whilst someone else is watching EastEnders on a smartphone.